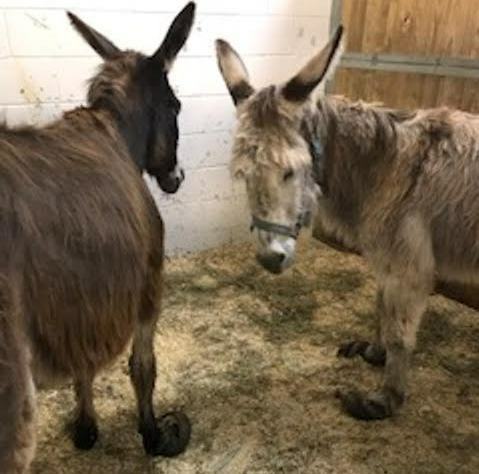 Apple Brown Betty is a 2007 standard donkey jennet who came to MHARF during a June 2017 Pine County humane case. This case involved 6 other donkeys, all of whom had not had any veterinary or farrier care for many years. Because of this neglect, several had hooves so long they could barely walk. Betty was not one of those in the worst condition but she did have very long and misshapen hooves and has required specialized farrier care. They were also all suffering from severe internal and external parasite infestations. Betty has come a long way since intake and is ready to find a new adoptive home with someone who preferably has experience with donkeys. She is extremely bonded to her friend May who came in during the same case and they do need to be adopted together. To see the Fox 9 News story about this case please Click Here. To see more information and photos from intake please Click Here!